Last night I stumbled back home around 10 PM or so. I wasn’t inebriated, just exhausted. Played a few hours of basketball and drove myself to go all out all night. I didn’t stumble on the court, just onto the porch of my house. As I walked up the steps one of my legs decided to mutiny and so I sort of fell into the door. Suppose I should be happy that no one videotaped my inadvertent headbutt into the door. I learned two things from the experience. 1) I have a hard head. No bruise from the encounter and thankfully no headache. 2) The door isn’t fragile. Intellectually I knew this, but I am a child trapped in a man’s body so I like to test things to see if they really do work. Once inside the mutinous leg decided that I am not Captain Queeg and rejoined the team. This was good as it made the shower that followed far more pleasurable. A short time later I wandered over to check on the children and marveled again at how peaceful they are when they sleep. Simply amazing…I used to sleep like that, careless and fancy free. In general I still sleep well, but it is not uncommon for my dreams to slip and disturb that careless state of mind I sometimes miss. I kissed the kids and whispered in their ears and headed out to the computer. It was time to do some work. Several hours later I strolled into the bedroom, lay down on the bed and stared at the ceiling. It was after 1 A.M. and I was wide awake and felt like I had enough energy to back to the gym. In the years prior to kids I might have done so, but I knew that in a few hours I had to get those kids out of bed. So I did what I could to relax and try to fall asleep. It took a long time, but eventually I dozed off. And of course this coincided with the dark haired beauty’s decision that she needed to sleep next to dad. Have I ever mentioned that she is like a 5.5 year-old version of the Tasmanian Devil? The girl kicks and rolls and flails about…all night long. And of course she uses my body as her personal punching bag. The end result is that I decide I am too tired to deal with this and she is old enough to sleep by herself. She didn’t wake up because of a nightmare or because she didn’t feel well. She woke up because she kicked off her covers and was cold. I picked her up and carried her to her bedroom. As soon as I put her down she jumped up and raced back to my bed. The little sneak had pretended to be asleep. Not only that, she had managed to help ensure that I got about three hours sleep last night. And then to add insult to injury she wouldn’t get up this morning. She moaned about being cold and whined about being tired. Since I am a kind man and never grouchy I growled and grunted something about giving away all of her toys and putting her to bed at 6 P.M. every night from today until 2098. Did I mention that not only was I exhausted but incredibly sore. The endorphins from the night before were gone and all that remained were sore muscles that screamed at me for asking them to work hard. As I stormed about the house I heard my son whisper, “abba is serious. Don’t make him any angrier he is impossible when he is tired like this.” I grimaced and wandered into the kitchen to make sure that their breakfast was underway. And then from out of nowhere I felt these little arms circle around me and I looked down. Dark eyes peered back up at me, a little cherubic face smiled. Silently I cursed, in 5 seconds she had made my anger disappear. It is unnaturally disarming. It is not supposed to work that way. I am supposed to make the choice about whether to be angry or not. Damn, damn, damn. I did my best to try not to smile and then she started laughing at me. It is not fair. She is using my tricks against me. I own the patent and the copyright on them and she still did it. Agrhhh. A dear friend and I had a long talk last night about life and how it doesn’t always work out the way you think that it will. Thoughts about our conversation carried over into this morning and I found myself thinking about some of the things that I thought would happen that didn’t. I remember thinking that I was going to fly home and pack up my stuff. Israel was where I wanted to be. I love L.A. I always have and I always will but there was something about Jerusalem that captured my heart. I fell in love with it and I couldn’t imagine not following up on that love. I wanted to have more than a month at a time to learn about it and to see if it was a summer romance or a life long relationship. The flight home was long. I wasn’t coming home after my first visit. I had spent a lot of time there before, but this was different. I was in my twenties and had no obligation to anyone but myself. The move back to Israel didn’t happen because life happened. Various things came about and now fifteen years later I look back at it and sometimes I wonder about the road not taken. It is a moment in time, a snapshot of my life that I can still see vividly in my mind. Three years later I went back to Israel, but this time I was married. It was a short trip, barely three weeks. A chance to show her around and try to sell her on a place that already owned a piece of my heart. It was a good trip, but we came home with the understanding that we would go back sooner than later. But things changed again. More than a decade later and I haven’t been back. My children have heard stories and want to go. One day we will. When we spoke last night my friend and I talked about his wife. It is his second time on the merry-go-round called marriage. He is exceptionally happy, or as I told him disgustingly happy. The two of them get googly eyed over each other. It makes me happy to see him so happy. The first wife was a problem. She didn’t look like a problem. Didn’t set off the radar and maybe she should have, but she didn’t. When she left he was blindsided. It was ugly and I felt badly for him. The experience changed his perspective and mine. But now I am confident and more importantly so is he that he has a much better partner. She is a better match for him in every way. And he never could have predicted this. Had it not been for the ugly experience he wouldn’t have ever met her. Can’t say that I am a fan of enduring great hardship so that you can experience something amazing, but I suppose that it has its benefits. I have written many times about friends and contemporaries that have died. At almost 41 I really shouldn’t be able to list more than a few, if any. Yet I can run down at least ten people that I knew. Ten people who have died during the past 14 or so years. Their deaths were all unexpected. When I look at them and I look at some of the other experiences I have had it makes me a bit crazy. Crazy in the sense that I am impatient to do the things that I love and to spend time with the people that I love. Time is fleeting and we have little control over many things. No matter how hard we fight time and try to master it we cannot win. It will move, things will change and we will find ourselves in new situations. So I am doing my best to roll with the changes and to influence the transitions from one phase into another as best as I can. My life is different from what I expected it to be 15 years ago. I can’t say that I am entirely certain what it will be like in five years. But I can guarantee that everyday I am working on doing the things that I need to do to get the most of out it. The biggest tragedy in my life, the one thing that I can’t accept is not taking a chance on living. So, I am going for it…again. Saludos my friends and you know who you are. It is a bit after two in Los Angeles. I haven’t shaved in two days so I have a healthy shadow running across my face. Dark circles beneath my eyes and a serious expression make me look a bit weathered and worn. You wouldn’t say that I am dressed to impress. I am barefoot and sporting a worn pair of denim shorts accompanied by a fine white T-shirt from the classic designers at Tar-jay. Might I add that the t-shirt sports a very fine photo of the Stay Puft Marshmallow Man. It is far more comfortable than the suit, tie and wingtips I once wore and far more my style. And today of all days it is not just well deserved but needed, this comfort line of clothing that is. 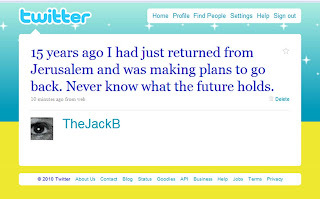 2010 may be the Year of Jack but this past week was not. I woke up today and felt like I was the star of a Neil Diamond song. Don’t ask me what that means because I haven’t a clue. Went to bed late and woke up early and that my friends is a recipe for a half crazed and cranky Jack. Some of you are asking the obvious question, what is the difference between you today and any other day. And the answer is that I don’t know. No one told me that there would be any math or science on this test. I didn’t pull a Sarah Palin, there is no crib sheet in my palm. No answers tattooed upon my thigh. I’d wink at you but you’d probably think that it was some sort of twitch or something. Right about now is when I’d like to pull out my guitar and start strumming. I’d do my best impression of Bruce Springsteen. I’d sing a song about the working man and how he fights for his family. I’d sing a song about the executive that puts in 60 hours and coaches his kid’s soccer team. I’d sing about the man and woman who love each other with the sort of fierce intensity that you hardly see and rarely experience. You’d find yourself singing along with me. You’d stand up and clap and wonder why you never knew that I had this talent. Later on you’d come up and ask me why I am not doing this professionally and I’d tell you that I am not a musician or a rock star. I am just a man who has a little life experience that you can relate to. But then again maybe I can take this energy, these thoughts and feelings and turn it into something concrete. That is the name of the book, the movie and the band that I want to read, write and start. Insolent Innocence is a name that came to me earlier today. To the best of my knowledge it doesn’t exist yet, that is, no one else is using it. Now don’t go getting any funny ideas because if you take it I will find you and do something. Don’t ask me what something is because I won’t tell you in advance. Ask my kids and they’ll tell you that this daddy blogger has a steely eyed glare that will make you flinch. If you are ever the recipient of it you’ll know. Or maybe you’ll think that I am squinting in which case I’ll have to take steps to disabuse you of such a silly idea. I can be quite persuasive. One of these days my buddy John Cave Osborne is going to make it out to L.A. and we’re going to hit a Laker game. The occasion might even merit a t-shirt with his picture on it, perhaps the one of him and the pink pillow. Ok, I probably won’t make the t-shirt. You can blame my laziness on having given in to the collective, I am a member of the instant gratification society. Instant gratification is our unofficial motto. We want everything now and if not now than in mere seconds from now. Instant gratification means that we carry and use our cellphones everywhere so that we can call people at a moment’s notice. No more wandering through stores or stopping at gas stations in search of a pay phone. No more worries about carrying a dime or a quarter for that call. Remember when it was a big deal to make a long distance call. Long distance calls were expensive and we were only too happy to see Ma Bell compete with MCI, Sprint and other providers of cheap long distance services. Cell phones helped to kill that. The proliferation of email helped to change things too. Email came along and changed written correspondence in a profound way. The speed with which it flew over the net made sending a letter by post seem quaint. Type, point, click and send and off it went. Cell phones helped change email as well. The evolution of the smart phone made it possible to check your email on the move. You weren’t tied down to a desk any more. You didn’t have to wait until you got back to the office or until you got home to see what messages awaited you. No waiting was great and something that we all pushed for. Technological advances that were designed to increase productivity and efficiency levels have impacted our attitudes about time. We don’t like waiting for anything and our attention spans reflect this. Fewer and fewer people are blogging or reading long posts. They’d rather spend their time sending texts or using Twitter. Why read 800 words when you can glance at 140 characters. Spend some time driving and you see more evidence of this impatience. People multitask as they drive and scream at those who don’t move as fast as they’d like them to. We’re like hamsters in a cage hurrying and scurrying about. And I include myself. I am guilty of all of these things. If you don’t answer my call I am ready to text and email you. And if you don’t respond to the text or email in a timely fashion I get irritated. It is narishkeit, foolishness this behavior. I hate it. I hate that when I call someone by the third ring I am already tapping my foot. I hate this expectation I have that everything should be happening now. It is not how life works. As much as I’d like to see the world cater to my every need that is just not going to happen. So I am making a conscious effort to take a deep breath and not react to all the stimulus. I am taking a moment to stop and enjoy the moment, whatever that moment is. And I am working on showing my children the value in doing that too. Life moves fast enough without adding any more stress. And now if you’ll excuse me I am off to do something else. Maybe I’ll look into making that t-shirt now.